Looking very much like yellow chimney-sweeps' brushes, the flowers of Colt's-foot are easily distinguished from other yellow spring daisies. Each stem has a solitary flower between 15 and 30mm in diameter made up of numerous narrow rays (most people call them petals, which is not strictly correct) surrounding central disc florets. 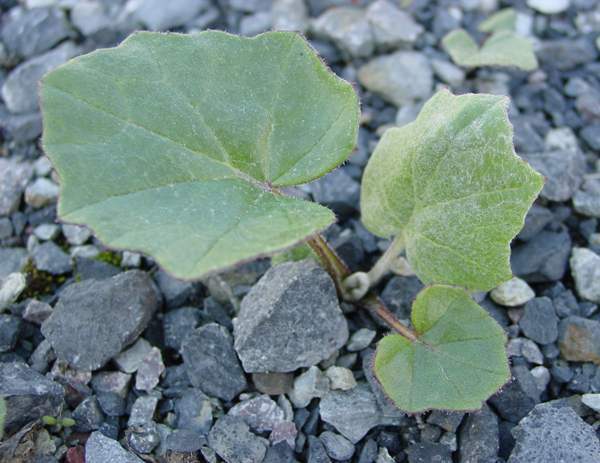 The pinkish stems, which are covered in scales, appear before the large heart-shaped leaves. Rather like Dandelions, the seeds of a Colt's-foot flower form a 'clock' (formally referred to as a pappus), each individual seed having its own hairy parachute. Clouds of these little parachutes are distributed upon the breeze. This spring wildflower is common throughout Britain and Ireland, and it occurs also in most northern European countries. We have seen Colt's-foot on the gravelly banks of the River Varzuga in Russia's Kola Peninsula, well inside the Arctic Circle. 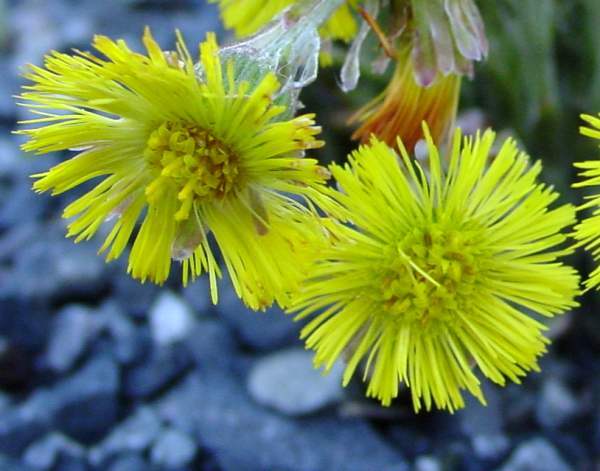 This wildflower was introduced to many oter parts of the world, including North and South America, for its medical properties, and has since become naturalised; as a result Colt's-foot is now an invasive nuisance weed in many places. Favouring poor soils and sunny locations, Colt's-foot often occurs beside ditches and streams or on compacted gravelly paths and tracks. The flowers first appear as soon as we get the first warm days in February and are usually over before the end of April; however, the 'clocks' are also very attractive. Colt's-foot leaves, which appear just as the flowers are fading (from whence comes one of its old common names 'Son before Father') continue growing throughout the spring and early summer months and eventually are large enough to be mistaken for Butterbur. 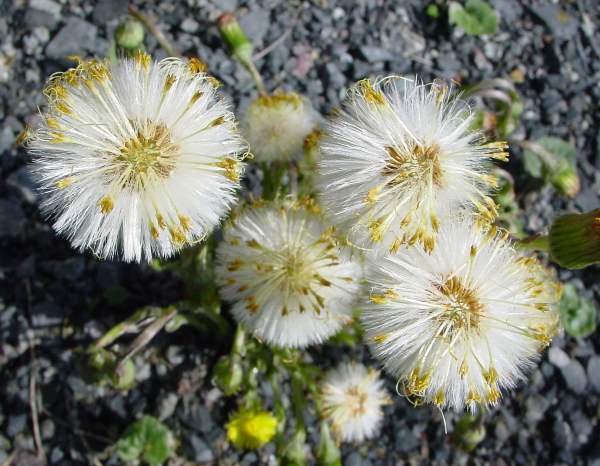 Tussilago, the genus name, is a reference to the reputed ability of Colt's-foot to cure coughs. (The Latin verb Tussere means to cough.) The specific epithet farfara is the ancient Latin name for the wildflower Colt's-foot. The English common name of this wildflower is written as Coltsfoot in some field guides. Seedheads of Colt's-foot were once used to stuff pillows, and in herbal medicine an extract prepared from the roots is used as an expectorant for the relief of coughs. 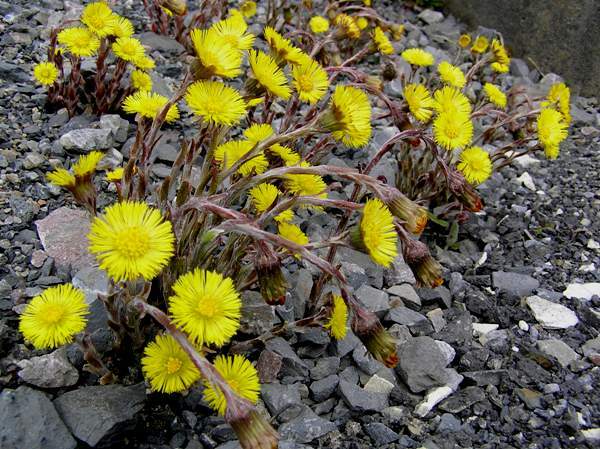 The Colt's-foot plants shown on this page were photographed in West Wales during February and March.